A pre-Halloween step taken by the Woodburn Public Art and Mural Committee will pave way for kids at play in the Downtown Plaza. 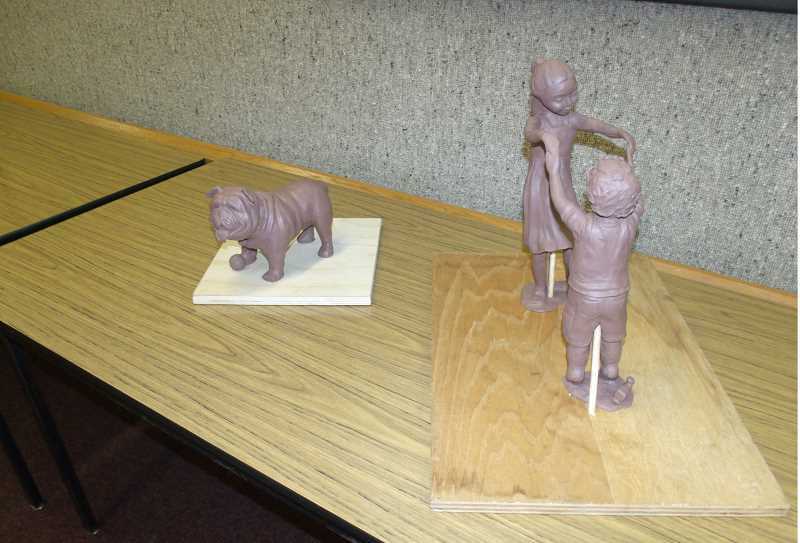 On Tuesday, Oct. 30, the committee voted unanimously (three members were absent) to approve the Downtown Plaza Art Project, which features bronze statues of two children playing London Bridge and a playful bulldog, the latter in recognition of Woodburn High School's mascot. The project will see the statues erected near the fountain just outside the Metropolis Marketplace. The committee spent months sorting out the project details, including identifying the artist, Mary Kirby of Canby, who created a similar project for West Linn's Youth Music Project. The committee received approval from the city's Urban Renewal Agency in August. Kirby was in attendance during the meeting, which included a public hearing held prior to the committee vote. "I want it to represent the joy that kids feel when they are playing," Kirby said. "The feeling (children) get when they get to play and when they get to enjoy each other's company." Several Woodburn residents addressed the committee to offer thoughts on the $56,500 project, two of whom favored the London Bridge statue but felt it would be better suited to the grounds at the Woodburn Public Library. "Those children would look wonderful under those trees," Ellen Bandelow said. Mary Beth Cornwell agreed, saying the sculptures would be more conducive to that setting, which hosts events like Music in the Park, while "the plaza is supposed to be simple and streamlined." Beth Laduca urged committee members and Kirby to consult the youth of Woodburn, particularly art students at Woodburn Arts and Communications Academy, if they felt represented by the statue. The committee posed some questions regarding installation and maintenance; the city is charged with installing the sculptures, which could cost as much as $5,000, increasing the anticipated total cost to between $59,500 and $61,500. Kirby noted that bronze sculptures are "very low maintenance" compared with other art, such as murals, which need frequent touching up. Sculptures require cleaning a couple of times annually and occasional waxing, tasks that the city of Woodburn can tend to without having to contract outside specialists. Robert Carney asked whether the committee's approval was a final step in pushing the project forward or would it come before the Woodburn City Council. Assistant City Attorney McKenzie Granum indicated that the committee held the latitude for approval, but the council could revisit it as an agenda item via a "call up" request. Kirby emphasized attentiveness to the timeline as the process involves a number of steps, including sculpting, molds, casting, welding, patina and delivery. The aim is to have the statues in place by summer 2019. The committee was formed in February of this year, and the plaza project is its initial undertaking. Committee Chair Frank Lonergan stressed that members did not take it lightly, and they hope to see more projects to fruition. "This is not the only project we are going to do; this is the beginning (of) hopefully many more that the city can be proud of," Lonergan said. The URA has about $100,000 budgeted for public art projects. The committee reportedly is mulling a peace pole, a symbolic monument installed in cities around the world representing a dedication to peace, near Woodburn City Hall. The wooden pole would read "May peace prevail on Earth" in four languages -- English, Spanish, Russian and Somali – and would complement benches and foliage.